In this section, we’ll discuss the origins and extraction of the important fossils fuels, including coal, oil, and gas. Coal, the first fossil fuel to be widely used, forms mostly on land in swampy areas adjacent to rivers and deltas in areas with humid tropical to temperate climates. The vigorous growth of vegetation leads to an abundance of organic matter that accumulates within stagnant water, and thus does not decay and oxidize. This situation, where the dead organic matter is submerged in oxygen-poor water, must be maintained for centuries to millennia in order for enough material to accumulate to form a thick layer (Figure 20.18a). At some point, the swamp deposit is covered with more sediment — typically because a river changes its course or sea level rises (Figure 20.18b). 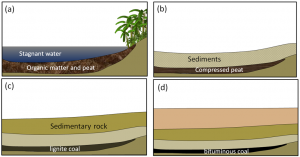 As more sediments are added, the organic matter starts to become compressed and heated. Low-grade lignite coal forms at depths between a few 100 m and 1,500 m and temperatures up to about 50°C (Figure 20.18c). At between 1,000 m to 5,000 m depth and temperatures up to 150°C m, bituminous coal forms (Figure 20.18d). At depths beyond 5,000 m and temperatures over 150°C, anthracite coal forms. There are significant coal deposits in many parts of Canada, including the Maritimes, Ontario, Saskatchewan, Alberta, and British Columbia. In Alberta and Saskatchewan, much of the coal is used for electricity generation. Coal from the Highvale Mine (Figure 20.19), Canada’s largest, is used to feed the Sundance and Keephills power stations west of Edmonton. Almost all of the coal mined in British Columbia is exported for use in manufacturing steel. 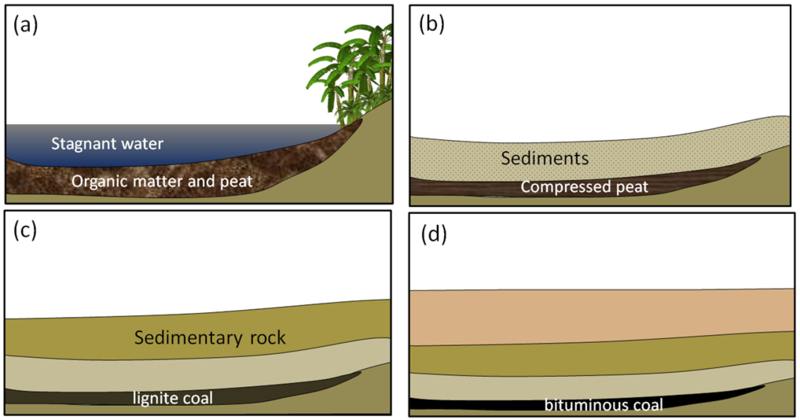 As the depth of burial increases, so does the temperature — due to the geothermal gradient — and gradually the organic matter within the sediments is converted to hydrocarbons (Figure 20.20). The first stage is the biological production (involving anaerobic bacteria) of methane. Most of this escapes back to the surface, but some is trapped in methane hydrates near the sea floor. At depths beyond about 2 km, and at temperatures ranging from 60° to 120°C, the organic matter is converted by chemical processes to oil. 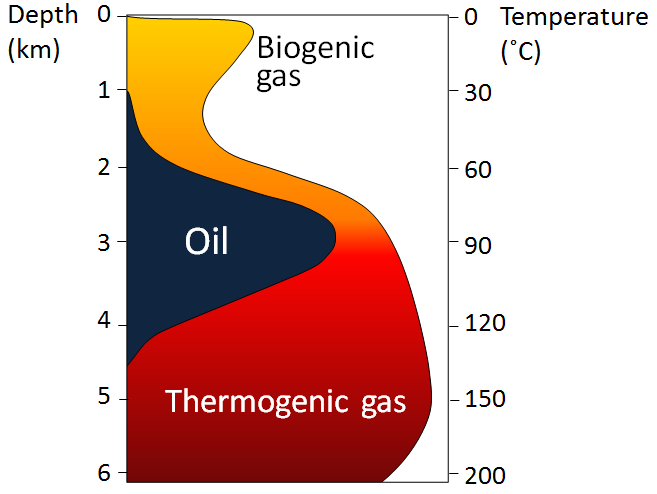 This depth and temperature range is known as the oil window. Beyond 120°C most of the organic matter is chemically converted to methane. The organic matter-bearing rock within which the formation of gas and oil takes place is known to petroleum geologists as the source rock. Both liquid oil and gaseous methane are lighter than water, so as liquids and gases form, they tend to move slowly toward the surface, out of the source rock and into reservoir rocks. Reservoir rocks are typically relatively permeable because that allows migration of the fluids from the source rocks, and also facilitates recovery of the oil or gas. In some cases, the liquids and gases make it all the way to the surface, where they are oxidized, and the carbon is returned to the atmosphere. 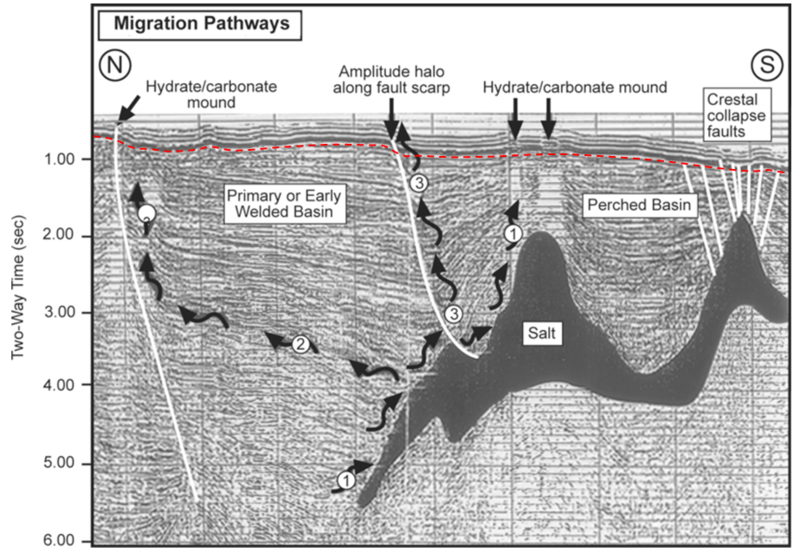 But in other cases, they are contained by overlying impermeable rocks (e.g., mudrock) in situations where anticlines, faults, stratigraphy changes, and reefs or salt domes create traps (Figure 20.21). In general, petroleum fields are not visible from the surface, and their discovery involves the search for structures in the subsurface that have the potential to form traps. 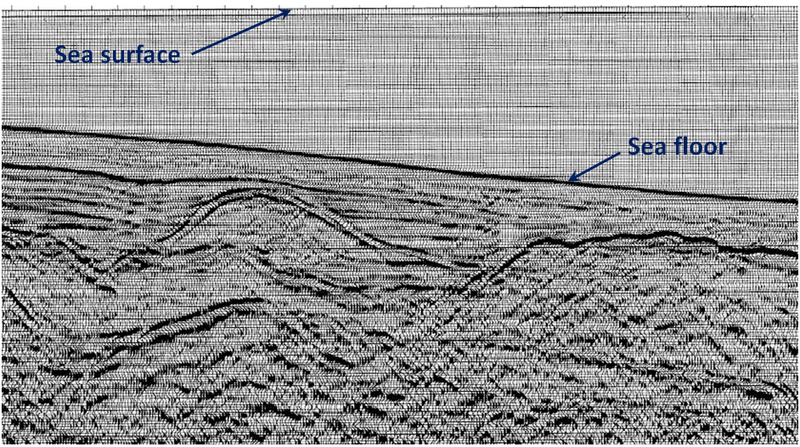 Seismic surveys are the most commonly used tool for early-stage petroleum exploration, as they can reveal important information about the stratigraphy and structural geology of subsurface sedimentary rocks. An example from the Gulf of Mexico south of Texas is shown in Figure 20.22. In this area, a thick evaporite deposit (“salt”) has formed domes because salt is lighter than other sediments and tends to rise slowly toward the surface; this has created traps. The sequence of deformed rocks is capped with a layer of undeformed rock. 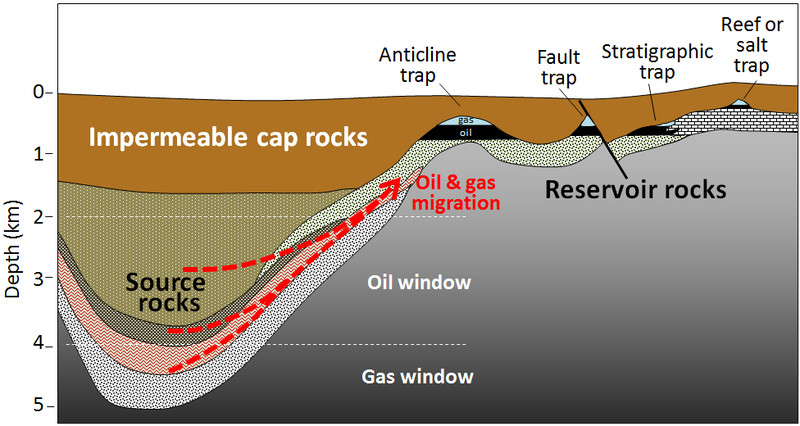 The type of oil and gas reservoirs illustrated in Figures 20.21 and 20.22 are described as conventional reserves. Some unconventional types of oil and gas include oil sands, shale gas, and coal-bed methane. Oil sands are important because the reserves in Alberta are so large (the largest single reserve of oil in the world), but they are very controversial from an environmental and social perspective. They are “unconventional” because the oil is exposed near the surface and is highly viscous because of microbial changes that have taken place at the surface. The hydrocarbons that form this reserve originated in deeply buried Paleozoic rocks adjacent to the Rocky Mountains and migrated up and toward the east (Figure 20.23). Shale gas is gas that is trapped within rock that is too impermeable for the gas to escape under normal conditions, and it can only be extracted by fracturing the reservoir rock using water and chemicals under extremely high pressure. This procedure is known as hydraulic fracturing or “fracking.” Fracking is controversial because of the volume of water used, and because, in some jurisdictions, the fracking companies are not required to disclose the nature of the chemicals used. Although fracking is typically done at significant depths, there is always the risk that overlying water-supply aquifers could be contaminated (Figure 20.24). Fracking also induces low-level seismicity. 20.3 Fossil Fuels by Steven Earle is licensed under a Creative Commons Attribution 4.0 International License, except where otherwise noted.